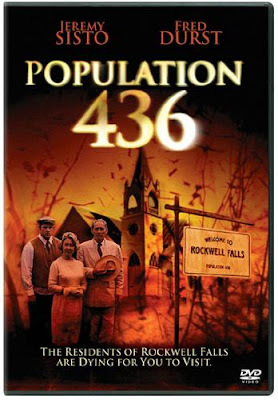 Full of traditional tropes, Population 436 is a somewhat muddled, largely cliche-ridden film that manages a bit of charm despite its overall disappointing experience. The narrative focuses on the mysterious goings-on in the little town of Rockwell Falls. Much is cribbed from Shirley Jackson's far superior take on this sort of story, "The Lottery:" Perfect little town, sort of a timeless place, but there's a powerful price the residents pay for their bliss and idyllic lifestyle -- one paid in blood. So, by now you've guessed the sort of tale we're spinning here. The twist is that the population has maintained a perfect number of 436 since the place was rebuilt after a fire, a fact that attracts the attention of the U.S. Census Bureau. They send their man, Steve Kady (played by Jeremy Sisto, best known for his turn as Billy Chenowith in the late and lamented Six Feet Under), to check it out. Mysterious deaths -- and arrivals, either in the form of births or new faces -- keep the population at a constant 436, a "perfect" number determined through some sort of pseudo-kabbalistic system divined by the gent who refounded the town 100 years ago. The residents believe that God himself punishes those who try to leave with the "fever," a malady that only the local doctor knows how to quell. The biggest problem is that the film is its predictability, the only question being will Kady, and the little girl he soon decides to rescue, make it out or not. There's the regular ending and an alternate ending, and I don't consider it a spoiler to say both possibilities are covered. Overall, there's too little explanation about the whole 436 business, which is unfortunate. There's some sort of malarkey about how if you stay overnight, then you're considered part of the town. This explains some obvious questions, such as why every UPS driver and grocery deliveryman isn't drawn into the darkness. There's also mention of some sort of dark stranger that came to the community in the past, busted its then-perfect 436 population, and started spreading sin and wickedness. The "great fire" was the supposed punishment for such transgressions. This potentially vital bit of history is only mentioned once and never delved into again. It feels like an utterly undeveloped, throwaway premise -- a shame because this background could have enriched the story greatly. A woman is shown, quite pregnant. The narrative, in fact, begins with a birth. It begs the question of how births and deaths are regulated, since they would have to be. I figured the doctor was some sort of abortionist, but they didn't go there. All of this stems from pure logic: When every accidental pregnancy means someone in the population has to die in exchange, there has to be some way to make sure you're not killing off all the adults at a dangerous rate. This is partially explained by a regular festival ala "The Lottery," dependent on the population, in which one person is doomed to die when the total hits 437. Random lots are chosen to see who will get the axe. The process answers some questions, but doesn't satisfy others. A predictable love triangle rounds out the mix of easily-augured components. Kady, the outsider, almost immediately attracts the interest of a local pretty young thing, a favorite of a Rockwell Falls sheriff's deputy. A conflict is inevitable. There's also a subplot with a missing family that's just too hokey for words. All this said, I didn't hate the film. There's enough creepiness to make it fun and plenty of screamingly-silly dialogue and plot points to keep you at least giggling. The sad thing is that there's the nascent seed of a really good movie in here, and all it would take is a bit more background and a touch more care with the plot. Hi there it's me, I am also visiting this website on a regular basis, this site is in fact good and the viewers are genuinely sharing nice thoughts. Hi, every time i used to check blog posts here in the early hours in the daylight, as i love to find out more and more.